Ana Mendiata, Untitled (Glass on Body Imprints), 1972, C-print, 10 x 8”. The joining of opposites not only characterizes the title of the exhibition “S/he Is the One,” but it also speaks to the reality-forging dimension of performative art in feminist and queer contexts presented at the center of this show. Historical as well as contemporary positions on the subject confront each other in the well-designed curatorial layout by Ursula Maria Probst, who plays with the physicality of the space by alternating dense and open installations of the included works. 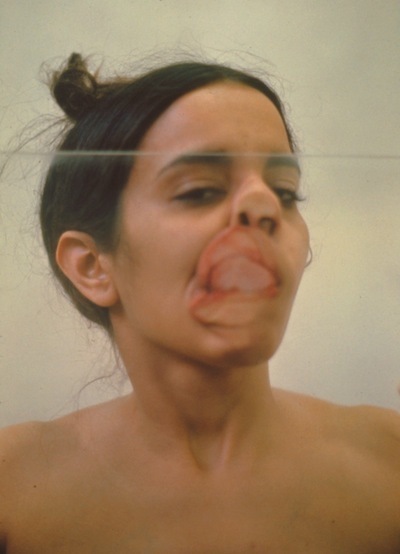 Within these dual tensions, “Untitled (Glass on Body Imprints),” 1972, by the Cuban performance artist Ana Mendieta, is most evocative. In this photographic series, Mendieta investigated her body by pressing herself against a sheet of transparent Plexiglas, thereby transposing herself into variegated, corporeal states of being. Anja Manfredi’s photograph Selbstportrait mit graukarte (Self-Portrait with Gray Card), 2013, by contrast, depicts the Austrian artist in a single state: In the black-and-white image, she holds one of her tools in her hand, the gray card used in analog photography. Rather than deploying it to calibrate the photograph’s exposure before the image is taken, the gray card’s inclusion within the picture introduces a neutralizing element to the single-perspective portrait. The exhibition also brings together installations under the conceptual moniker “performative sculpture.” Interperformativität (Interperformativity), 2013—also by Manfredi—includes a movable mirror that is positioned in the visitors’ space so that their likenesses are reflected from almost every possible angle. Mathilde ter Heijne and Amy Patton similarly foster viewer participation in their ad hoc photo studio, where, during the opening of the exhibition, a man’s testicles were photographed. Though depictions of erect phalluses are qualified as symbols of power and potency, the images that are developed here, such as Gentle Men, 2012, perceive masculinity through its sensitivity to exposure. Thus, the oppositions that would normally characterize the male/female dialectic are throughout “S/he Is the One” skillfully inverted and transformed into unified complements.